The Pink Floyd Exhibition: Their Mortal Remains, the critically acclaimed major retrospective of the band which recently finished at London's Victoria & Albert Museum, has now confirmed its next location on its tour. The announcement, via a press conference with Pink Floyd founding member Nick Mason, was that it will be opening at Rome's Museo d'Arte Contemporanea di Roma (MACRO) on 19th January 2018. 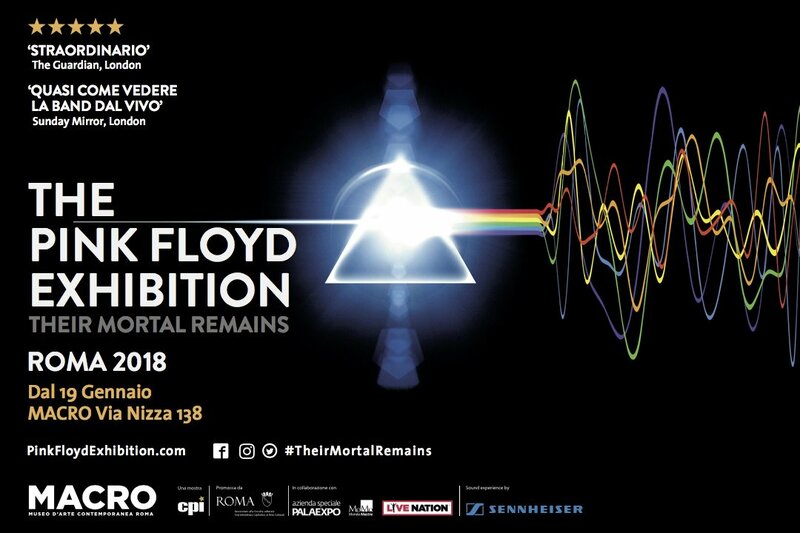 Apart from a Rome-exclusive video, the organisers also note that there will be new exhibits added exploring Pink Floyd's relationship with Italy. This exhibition will be the first to take place at the museum under its new management, Palaexpo. Following its highly-successful debut at London's Victoria and Albert Museum earlier this year, which saw over 400,000 people tear down the wall, the exhibition moves to Rome as its first international destination on the global landscape. 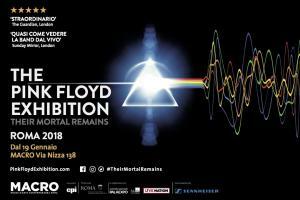 The exhibition continues the first collaboration in decades of Pink Floyd's remaining members and is produced and promoted globally by Michael Cohl of Concert Productions International B.V. The Rome exhibition is produced in association with MondoMostre and Live Nation. Tickets are on sale today via Vivaticket.it, all Vivaticket outlet locations and by phone on +39.041.2719035. The exhibition’s phenomenally successful and mammoth run at the V&A, described by national British newspapers as "stunning", "a real feast for the senses" and "almost as good as seeing the band live", was the most successful exhibition of its kind. The run at Rome's MACRO will be a continuation of this vast success. MACRO is located less than 1km from The Piper Club, which played host to Pink Floyd's first shows in Italy in April 1968. As before, the flow of the exhibition, in chronological order, is enhanced throughout by music and the voices of past and present members of Pink Floyd, including Syd Barrett, Roger Waters, Richard Wright, Nick Mason and David Gilmour, talking about their musical experiences through their experiences and musical experimentation via sound specialist Sennheiser's intuitive GuidePORT system. This culminates in the Performance Zone, where visitors enter an immersive audio-visual space, which includes the recreation of the very last performance of all four members of the band at Live 8 in 2005 with Comfortably Numb, specially mixed using Sennheiser's ground-breaking AMBEO 3D audio technology, as well as a Rome-exclusive video of One Of These Days, taken from the band's iconic live performance in Pompeii. Admission is priced from €18 for adults, with concessions available. Advance booking is VERY strongly advised; certain sessions for the London staging quickly sold out. We'd also advise you to book sessions that start no later than lunchtime if you really want to take your time over the exhibition - we had many reports of people spending five or more hours absorbing all the detail in London!